Scotland may be famous mainly due to great scotch, haggis and the bagpipes. But by far Scotland’s cutest export is the Scottish Fold cat. Believe it or not, all Scottish Folds can be traced back to Perthshire, Scotland, and particularly to one little white cat named Susie. In America, Scottish Folds have become very popular, with owners like Taylor Swift joining lengthy waiting lists and paying several hundred dollars for a Scottish Fold kitten. Don’t want to prepare your own homemade cat food recipes? Wondering what should be on your Scottish Fold cat food diet? We’ve got some fantastic Scottish Fold cat food suggestions right here. So what brands made it to our top recommendations for the healthiest canned, soft & wet cat Food for Scottish Folds? Because you choose portion sizes according to your cat’s weight goals, this food makes portion control easy for Scottish fold cats who need to lose or gain weight. The company’s fish recipe is exceptionally low in carbohydrates, with just 5% calories from carbs. It’s primarily made from highly-digestible animal protein. If only cat parents had such a balanced diet! Wellness Complete is a complete grain-free meal that’s sure to have your kitty purring with delight in no time at all. 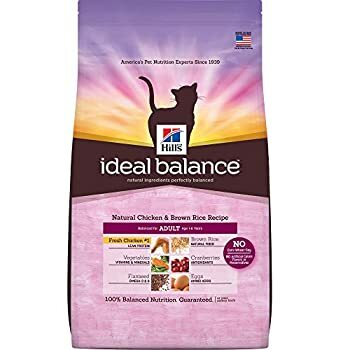 Featuring a carefully blended mix of the leanest protein – as well as fresh vegetables and fruits, it also packs an antioxidant punch to protect your Scottish Fold cat’s health. Tasty turkey and simply delicious salmon to provide all the protein your Scottish Fold needs. Very high quality protein. Totally grain-free. This will be lighter on your Scottish fold cat’s sensitive tummy. Featuring added cranberries. Great for maintaining a healthy urinary tract. 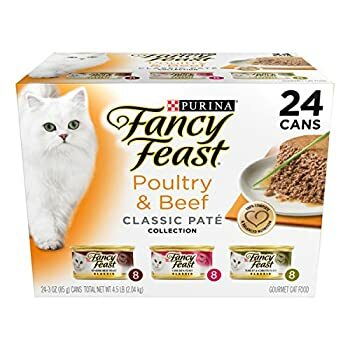 Purina’s Fancy Feast Collection comes in the 3 delicious flavors of turkey, beef and chicken that cats love. 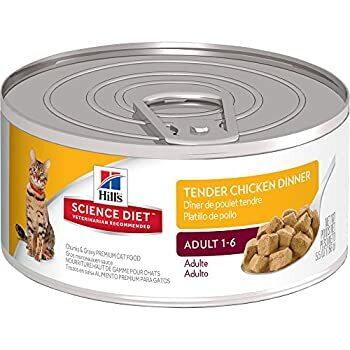 This product comes in perfectly proportioned tender bites and is covered with a tasty gravy that will bring your cat back to its bowl time and again. High-quality nutritious ingredients to suit the palate of the pickiest Scottish Fold. Pre-sliced, so you won’t have to get your hands messy preparing your cat’s meal. No wheat gluten and less than 10% carbohydrates – keeping your Scottish Fold cat happy and healthy. The Hill’s Science Diet’s wet food is another great product for your Scottish Fold cat. 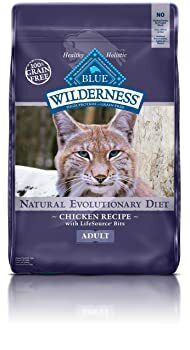 This food is a perfectly balanced meal of tasty chicken chunks, in a mouth-watering gravy, with exactly the right nutrition that your cat needs. Recommended for adult Scottish Fold cats aged from 1-6 years. Hill Science Diet is free from artificial flavors or preservatives. Features a healthy blend of vitamins C and E to help support your Scottish Fold cat’s immune system. Even though it is recommended to feed your cat mostly with raw meat, dry food is still legitimate and can be an occasional routine breaker. So what about the best Scottish Fold cat dry food suggestions you ask? 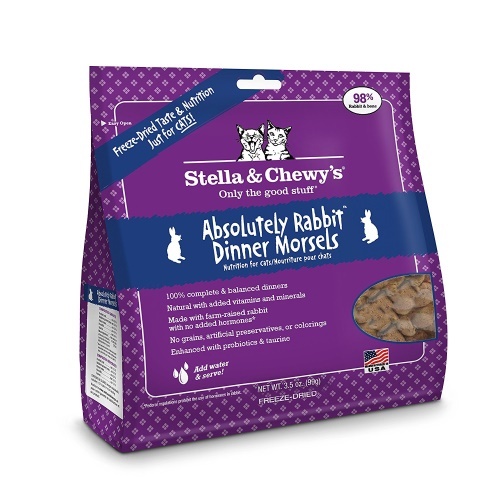 Rabbit is a natural part of the feline diet and a cat favorite. 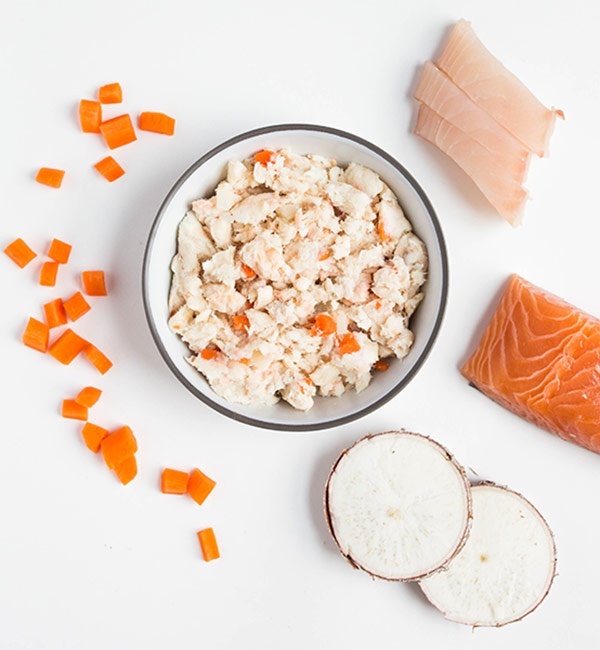 Along with rabbit, this recipe contains prebiotics and probiotics to keep your Scottish fold’s digestive system healthy and their immune system strong. With over 70 years experience in making great pet food, the manufacturer of this product knows exactly what’s good for your Scottish Fold. High quality fresh chicken protein, plus no wheat, corn or artificial flavorings will make for a great product for your feline. Made also with brown rice, this food has enough natural fiber to keep your cat’s digestion in good shape. Omega 3 & 6 supplements will take care of your cat’s coat, for a healthy shine. Ideal for mature adult Scottish Fold cats. Great tasting natural ingredients keep your Scottish fold coming back for more. 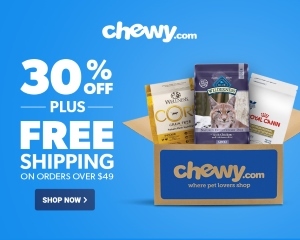 A fantastic balance of vitamins, minerals, and lean high-quality protein means your cat gets just what it needs to stay healthy and satisfied. 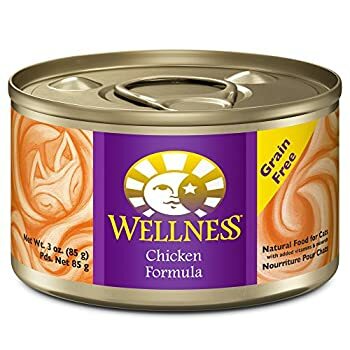 With a high concentration of quality chicken and sweet potatoes that provide for a healthy complex of carbohydrates, this dry food contains natural ingredients and no chicken by-products, no preservatives, wheat or corn. Cranberries, blueberries and carrots supply antioxidants, together with vitamins and minerals that will give your cat a balanced meal. One-third of the meats are air-dried, dehydrated turkey and chicken. Great source for high quality protein. Contains 40% protein and 20% carbohydrates. Good for cats that need a lean diet. Contains no corns or grains, so it is easy on the cat’s digestive system. Great for cats who suffer from throwing up when eating certain grain-rich cat foods. These days, food allergies among cats is a common problem that owners face. Just like humans, cats can develop allergies too. There are seasonal allergies, all year round allergies and of course – food allergies. So what should you avoid if your Scottish Fold cat has food allergies? Food allergies usually affect Scottish Fold cats that are exposed to specific allergens for a prolonged time. Unfortunately, a popular lack of owner knowledge can lead to many inappropriate food ingredients finding their way into your feline’s plate – like wheat, corn and cheap carbohydrate grain fillers. When consumed regularly, these additives can upset your cat’s digestion and lead to a leaky gut and the development of food sensitivities or even food allergies. To avoid your Scottish Fold from developing food allergies, you can ensure that you feed your cat a raw food diet or hypoallergenic cat food that lacks ingredients like grain, starches, corn and fillers as much as possible. Also, because your Scottish Fold’s food is likely to be high in protein, it’s important to change their food on a regular basis, so that they get a variety of different proteins. If you’re wondering what makes the best Scottish Fold home food, the answer is rather simple – meat, preferably raw. You’ll find that Scottish Folds can eat a combination of wet and dry foods, but the emphasis should be on fresh meat while avoiding too many carbohydrates. Raw beef, chicken, turkey and chicken liver make the best Scottish Fold kitten food; while adult cats can consume fresh vegetables and dairy too. Remember, just because Scottish Fold cat food habits includes a raw diet – doesn’t mean that the food you serve them should be cold. Even though microwaving should be avoided, serving your feline’s meat gently warmed will be a far more pleasurable experience for your cat. And don’t forget, food poisoning can affect your cat too, so make sure the meat is fresh and hasn’t been sitting out for too long before feeding time. These easy-going, highly entertaining and lovely cats are a joy to have around your home. They will form strong bonds with your family members. Remembering to take the time to properly care for your Scottish Fold cat’s diet and nutrition will ensure that you have a fun and friendly addition to your family for many years to come. I love this website! I was doing research on the Scottish Fold cat, and I found your site! So useful. Hi we have a new Scottish Fold kitten 4 months old and looking for the best recommended kitten wet foods to try. As the ones in this article seem to be for cats older than 1yr what would you recommend? For kitten food suggestions, I recommenced reading our article on the best kitten food written by Mallory Crusta.